Flour is a powder made from the grinding of wheat used for human consumption. Wheat varieties are called “soft” or “weak” if gluten content is low, and are called “hard” or “strong” if they have high gluten content. Hard flour, or bread flour, is high in gluten, with 12% to 14% gluten content, and its dough has the elastic toughness that holds its shape well once baked. Soft flour is comparatively low in gluten and thus results in a loaf with a finer, crumbly texture. Soft flour is usually divided into cake flour, which is the lowest in gluten, and pastry flour, which has slightly more gluten than cake flour. 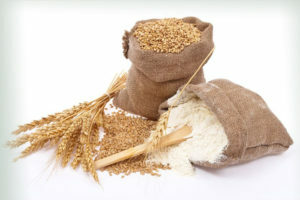 In terms of the parts of the grain used in flour—the endosperm or protein/starchy part, the germ or protein/fat/vitamin-rich part, and the bran or fiber part—there are three general types of flour. White flour is made from the endosperm only. Brown flour includes some of the grain’s germ and bran, while whole grain or wholemeal flour is made from the entire grain, including the bran, endosperm, and germ. Germ flour is made from the endosperm and germ, excluding the bran. India is a huge producer and exporter of Wheat Grains and Wheat Flour. With the assistance of our packaging experts and advanced machines, we became capable of meeting the standard as well as customized packaging requirements of the clients.